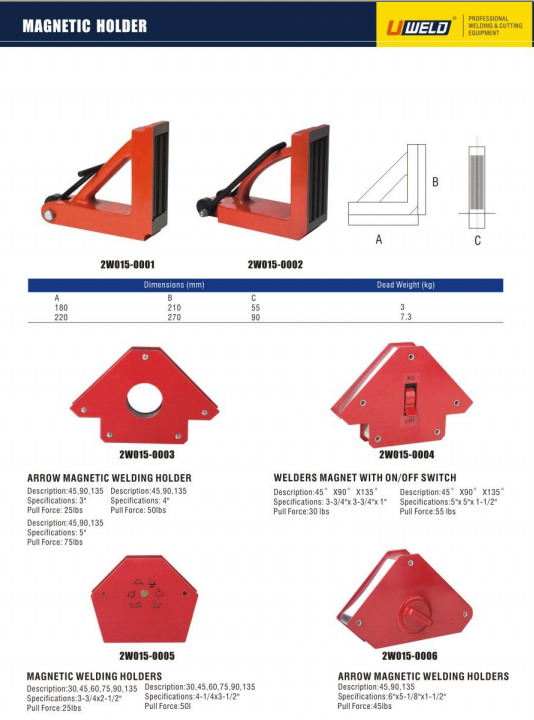 Product categories of Magnetic Welding Holder, we are specialized manufacturers from China, Magnetic Welding Holder, Magnetic Angle Welding Holder suppliers/factory, wholesale high-quality products of Arrow Magnetic Welding Holder R & D and manufacturing, we have the perfect after-sales service and technical support. Look forward to your cooperation! Magnetic Welding Holder is widely used in the field of welding, welding materials can be made up of 45 degrees or 90 degrees angle, and the solid material together to complete the welding! Strong suction, easy to use, many kinds, there are 25LBS, 50LBS, 75LBS for choice. 1. This product is used in hardware finishing and welding of the iron parts of the construction industry. It is a good assistant for you to weld. 2. The Arrow Magnetic Welding Holder can also be used in hardware, plastics, chemicals, pharmaceuticals, ceramics, building materials, tobacco, cotton, food and other industries, except iron, filtration and mechanical equipment, metal mold, fixture positioning. 3. Advantages: the magnetic properties and strong adsorption range, easy and convenient use, greatly improving the efficiency.